A beauty post? On The Ginger Diaries? Well, waddayaknow, I can still be a little bit surprising! Those who follow me on Instagram may have noticed that I was on a quest to find the perfect perfume, and that my quest eventually ended when I sniffed Jo Malone’s Peonies & Blush Suede. I just love it! When we were in Brussels just after Christmas, my boyfriend and I made a stop at Senteurs D’Ailleurs (Place Stéphanie 1A) for a late Christmas gift. 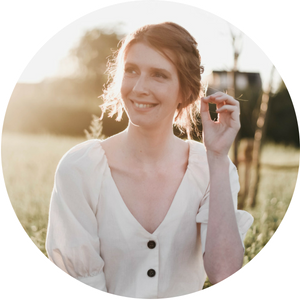 I had heard so much about Jo Malone from other bloggers, and the luxury perfumery in the heart of Brussels was at that moment the only sales point in Belgium. I tried Pomegranate Noir, Orange Blossom and Peonies, and it was obvious right away which one was coming home with me. Sadly, it had sold out and it would be a few months before we’d be in Brussels again. Ten times hallelujah when we went to Lisbon and Jo Malone had just opened up a shop in the tax-free zone at Brussels National Airport. My favorite perfume at 30% off! sco-oh-ooore! Okay, okay, you are probably more interested in what Peonies & Blush Suede smells like, than the story of how I found my bottle. How cool would it be if we could blog in 4D? Unfortunately technology isn’t that far yet, so you’ll have to do with a description (and a run to your nearest sales point). Jo Malone describes it as luxurious, opulent and flirtations, and I would want to add to their enumeration that it’s a very light and fresh scent. It’s a very subtle perfume, and because of the softness of the scent I was afraid that after a few hours of wear it would be almost completely evaporated. But I’m very happy to say I finally found a fresh floral perfume that stays noticeable all day! Apart from the subtle scent of peonies, those who have an advanced olfactory will also discover red apples, jasmine, roses and gillyflowers. If you read through my Lisbon post – congratulations if you made it through the end – you may also know that I did in fact break my shopping ban juuuust a little at Kiko Cosmetics. Their nail polish is my favorite in the world. Well, I’m probably not your best source for nail polish info as I’ve only had experience with Essie and Kiko. But yes, I think Kiko is better for my nail type than Essie. Even without a base – and top coat, the Kiko nail polishes don’t chip before a week of wear and don’t stain my natural nails. After wearing my Essie Shearling Darling or Fishnet Stockings my nails are pink for two weeks, and with Kiko being €2.90 and Essie and easy €11, I know where to go! 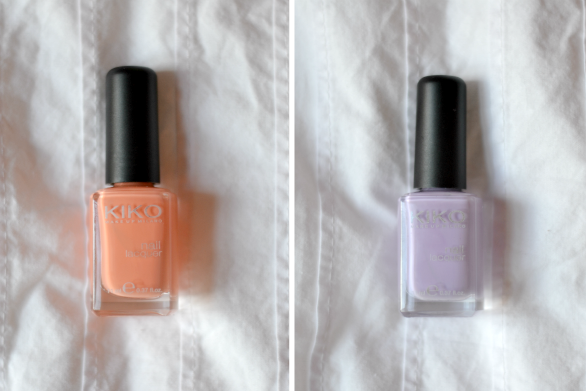 I already owned a white, soft blue and light green shade, and added these coral and lilac shades to my Kiko collection for Spring! One of my uni friends is smitten with the coral, and I can’t blame her. So far, it’s the only polish I’ve tried on and if my boyfriend wouldn’t hate polished nails so much, I wouldn’t have removed it yet! Generally, one layer of polish covers my nails nicely enough, but the lilac is very light so I might have to add a second layer to get it right. Using my white base coat makes these pastel shades look even better. Bloggen in 4D, I’m with you babe! 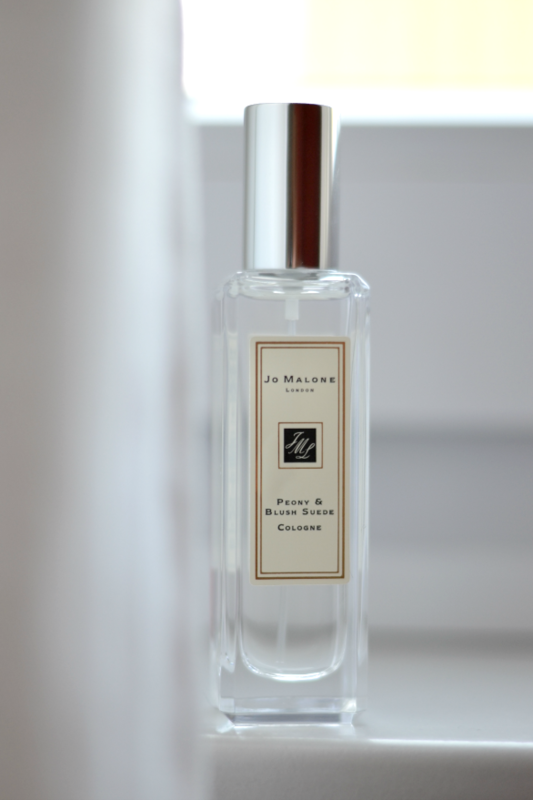 Ik was na al die online reviews ook benieuwd naar Jo Malone en ik heb de Nectarine, blossom & honey, ruikt ook heel goed en blijft inderdaad lang hangen. That perfume sounds like it smells amazing! I love subtle floral scents too! Those nail polish colors are spring perfection! I love the perfume bottle! It’s so simple and classic yet I don’t think I’ve ever seen one like it! Ik moet dan ook eens dringend Kiko uittesten! Wat betreft Essie hangt het echt af welke kleur ik gebruik. De rood-achtige tinten brokkelen er snel af terwijl de heel donkere kleuren en tinten met glitter in er super lang opblijven..
Trouwens ik wil ook al héél lang een Jo Malone exemplaar, ruikt zo goed! Love the Jo Malone! Hoe zalig zou 4D wel niet zijn!!! Oeh mooie beautyproducten zeg! Haha en ik was inderdaad even verbaast om hier beauty te zien verschijnen, but I like! 😀 Ik heb ook een Kiko-lakje en het is inderdaad erg goede kwaliteit en veel goedkoper dan Essie 🙂 Mijn favoriet blijft wel Ciaté, beste nagellak in de wereld voor mij. Trouwens, lucky you dat je dat tax free hebt kunnen scoren die parfum! Dat parfum van Jo Malone klinkt heel erg lekker. Sjansaar dat je het met korting hebt kunnen kopen!